Browse through our archives to find the latest and greatest in POWERQUIP's BRUCE technology news. 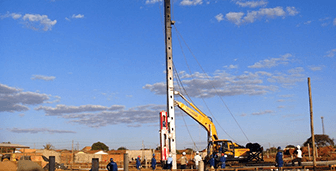 The BRUCE provides the most ideal, innovative concept and cost-effective Base Mounted Type of Hammer over the world that can be replacing the Piling Rig with a vast amount of money. This customer friendly Base Mounted Hammer was manufactured started from a piece of advice from the excavator operators at job sites to get the BRUCE Hammer mounted to customized Excavators to be more practical and economical according to its size and model of their owned. 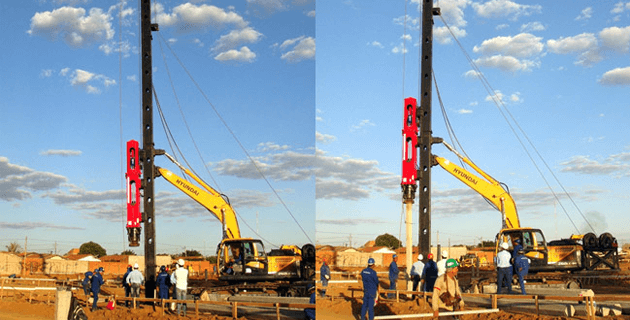 Until recently, there are more and more customer’s request to supply the BRUCE’s unique Pile Base Mounted Type of Hammer that will fulfill the needs for those people who are reluctant to purchase a high priced piling rig. If you apply all of the BRUCE concepts here, your work will enjoy the powerful competitive advantage that making a great profit at working site. The first priority for BRUCE to focus on this equipment is the safety pile operation, hence, it can be transported without special arrangement in one piece when it move and work at sites with the development of their small transport dimensions led to having it without removing the hammer during its transportation. The low center of gravity, and an Extension Base at the back of Excavator as a counterweight ensure excellent equipment stability and this allows greater leader stability to let the Hammer picking the piles and driving the piles to be more accurately. BRUCE’s experience has resulted in a wide benefits for Excavator operators, not only to utilize the Hammer efficiently but also to the safety, comfort and to ease of service and maintenance. Welcome to BRUCE PILING EQUIPMENT !